The theme of this year's TEDxPeachtree was "illuminate," but it is nearly impossible to use one word to describe the October 17th gathering. Brainwave-derived art, personalized cancer treatment, artificial intelligence, talking dogs, mathematical origami and other amazing skills and discoveries were presented to a captivated audience at the Buckhead Theatre in Atlanta. Thirteen men and women, along with a canine, came to the stage in four segments: Frontiers, The Lab, Sensory Precussions, and Play. They presented their solutions, ideas, and talents to prove that we do not have to go with the status quo. Attendees saw firsthand how one person’s idea can ignite great change in our world. In Frontiers, the presenters had asked, "What if?” to possible solutions to a myriad of problems, and allowed their passions run free in pursuit of answering those questions. Keith McGreggor explained fractal thinking and showed us how our ability to see novelty and abstraction separates us from artificial intelligence, a multi-layered concept he was able to effortlessly explain to the audience. One attendee commented, "Keith's was my favorite talk. His thought process on thought processes was great. And he was able to explain it in words that everyone can understand." Shannon Zirbel's love of space and origami led her to the creation of the Hanaflex design used in the deployment of NASA solar arrays. The PhD candidate's work in compliant mechanism theory in space technology has led to the creation of lightweight solutions to problems in advancing the exploration of the final frontier. But the crowd favorite easily went to the dogs, literally. Melody Moore Jackson wowed the audience with her presentation of an interactive vest for service dogs that takes their ability to communicate beyond what we are accustomed to seeing. In a TEDx first, the speaker was joined onstage by man's best friend; Blitz the Border Collie tugged a pull cord mechanism attached to her vest and spoke by triggering a recorded call for help. In The Lab, our minds were introduced to people who brought light to concepts of cancer, agriculture and livestock and the human mind. Erico Mattos’s discovery of the use of biofeedback in hydroponics to know when plants have had enough sun had many in the audience talking. “The plants can turn the light on and off? That is unreal,” commented one young woman. Ion Popian demonstrated how he transforms brainwaves into tangible objects and Adam Marcus spoke on taking the process of cancer treatment to a personal level. His concept of using individualized systems of care that utilize old and new therapies is changing the way doctors battle the disease. Video of the 2013 TED Talk by 13-year old Richard Turere brought smiles with his tale of using solar energy, and a bit of ingenuity to keep the lions away from his family’s cattle in Kenya. His youthful exuberance and inventive mind gave a glimpse at the bright TED talent we can expect to see in the future. TEDxPeachtree is not complete without the inclusion of entertainment to inspire audience members. HeaveN Beatbox and Christopher Erk brought their gifts of vocal percussion and dance in the Sensory Percussions and Play sections of the program. Apart, their performances were brilliant; together onstage; this duo left attendees in awe. The second half of the day included passive learning success stories from VR expert Thad Starner, possibilities in memory recall and capturing moments for future generations using that same virtual technology from Derek Fridman, body owning champion Abby Norman, sun gazer Genna Duberstein, and the final talk of the day by Chantelle Rytter. Her call for civic play as an impetus for community building segued into a grand finale of glowing lanterns and music from The Wasted Potential Brass Band. 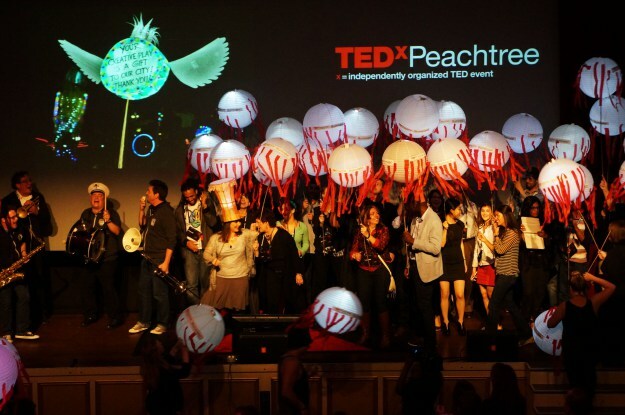 Inspired and illuminated, attendees left the day's event wondering, “How can they possible top that?” Guess they'll just have to wait until TEDxPeachtree 2015 to find out! Maria Pinkelton is the Communication Specialist for the Center for Leadership in Disability at Georgia State University. She lives in Decatur with her husband and son, along with a fine collection of books, craft beers and size 11 shoes.